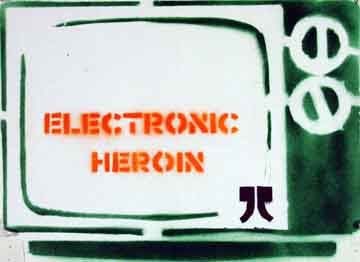 This is a stencil from 2004 when the theme was media. STREET ART WORKERS SAW was founded in March 2001. Every year our members pick a theme, make art, and put up each other´s work. We aim for the largest possible impact by posting art simultaneously across North America. Most people in the network exchange posters, stencils or stickers designed for guerrilla wheat pasting or spray painting, but SAW submissions are limited only by your imagination. Submissions need to be mass produced, easy to ship and relatively easy to display. Production costs are covered by each artist, and distribution costs are covered by SAW. The group is run by volunteers with a shoestring budget, but our collective strength promotes all of our work. The most recent project is about globalization.